Jacob was in a bind!! He was returning to the land and his brother, an enemy that desired his inheritance and blessing, was waiting for him. What to do? Jacob decided to divide all he had -the people, the flocks and the herds and the camels- into two companies. He reasoned, if Esau attacks one company, perhaps the other will escape. But even in this division, the family had never really been a united family. Rachel and Leah were at odds from well before this division. Now, in separate companies, they crossed the river, Leah ahead of Rachel, where they would face their fate as one company, with him at the lead. After dealing with Esau, Jacob took his entire family and all he owned and journeyed to Succoth and built for himself a house. While the actual story told in Genesis 32 and 33 has many more details, I can’t help but wonder if, in its basic points, it is prophetic of the last 2500 years. A couple of days ago we began a series looking at a common error in Christianity and Judaism wherein the terms ‘Israel’ and ‘Judah’ are regarded as synonymous in spite of the many Scriptures pointing to differences and divergent paths for each with their coming together in the latter days. Looking at our initial story, we know the history of Leah and Rachel and how their animosity played out with their sons, Judah and Joseph. 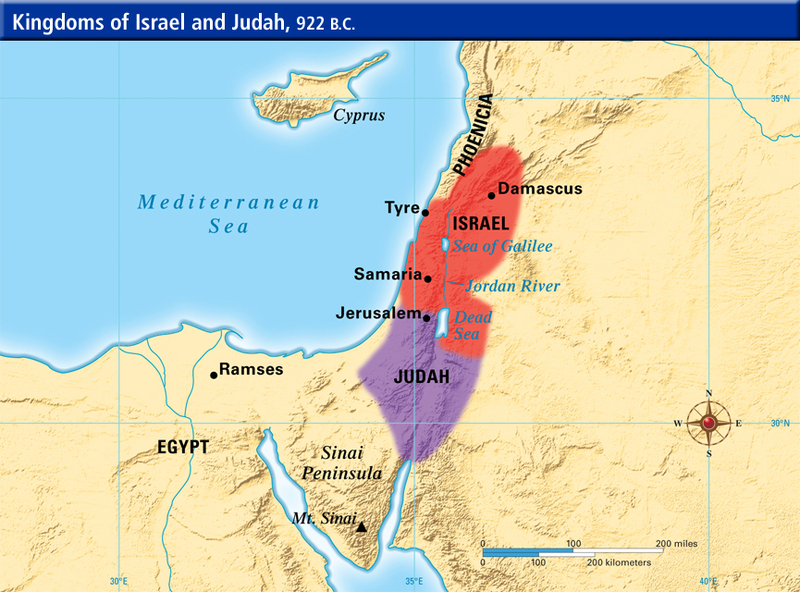 While we will not delve into the possible identity of Joseph in prophesy at this time, we do need to take a bit of time and consider the historical development of Israel v. Judah, as evidenced through much of the Tanach. The point at which the Israel v. Judah competitions began can surely be traced back to Leah and Rachel, exacerbated in part by Joseph, through his sons, Ephraim and Manasseh, receiving the double portion while Judah received the scepter. But the real fulness of their jockeying for position was not made manifest for a while. Likely, it happened earlier, but the first major division that I find occurred about the time Saul, of the tribe of Benjamin, was made king. In a passage we looked at a couple days ago, Scripture draws a distinction, possibly prophetic in nature, between Israel and Judah. David followed Saul as king, reigning over Judah (2 Sam. 2:4) for more than seven years before the rest of Israel came under his banner, and only under he and his anointed son, Solomon, was the ‘whole house of Israel’ united. Even before Solomon died, the prophet foretold that the kingdom would be divided with ten tribes going one way and two the other (1 Kings 11:31). Contrary to any logic of ours, Scripture explicitly says that it was the will of the Father to divide the kingdom (1 Kings 12:24). When David’s kingdom was divided into two, the ten tribes to the north came under the kingship of Jeroboam who was from the tribe of, no surprise, Ephraim, the son of Joseph!! Judah and Benjamin remained together under the reign of Rehoboam of the line of David. Now, the historical competition could really heat up! Both kingdoms managed to anger Yahweh through paganism and idolatry, but the northern kingdom of Israel was especially proficient!! 1 Kings 12:25-33 recounts the precision and evil intent of Jeroboam as he willfully drove a wedge between Israel and her God by creating false holidays, pagan idols and intentional syncretism with the nations. It was as if he read Deuteronomy 12:29-32 and used the warning as a gameplan. Judah was disciplined separately by the Babylonians some 150 years later. They were exiled, then exactly as the prophet Jeremiah foretold, they were returned to the land 70 years later. No such return of Israel is ever recorded. Certainly, there are a few instances of individuals from Israel who managed to maintain their identity and rejoin Judah, but unlike the return of the Jews as recorded in Ezra and Nehemiah, there is no record of large numbers of Israel returning to the land. The honest historian can only conclude that most all were assimilated and by all outward appearances, the northern kingdom had ceased to exist. I hope over time in this series to study how various prophets foretold this event and what their future expectation was/is for the northern tribes. The simplistic understanding, for the purpose of this brief overview, is that a tiny remnant of Israel returned with Judah, but there yet remains an unfathomably large fulfillment in the future wherein, by some miracle of Yahweh, the ones that Hosea said were ‘not My people,’ will come from the four corners of the earth weeping as they go to again be called ‘sons of the Living God’ to dwell in the land. As we began this series, we considered the error of believing ‘Israel’ and ‘Judah’ are synonymous terms for the same people. While there are occasions where that is true, there are numerous Scriptures that clearly portray the two as separate companies, intentionally divided by the Father until such time as He again brings them back to the land. Considering our opening story as a possible prophecy, is it possible that, like Jacob, our Father divided the family into two companies in order to safely convey them across the river into the land before Sukkot? [For those not familiar, please study out the Feasts of Yahweh. Sukkot is the final feast of ‘ingathering’ with a specific picture of the nations coming to worship the King. It is also the last feast in the cycle of redemption the first four of which have been fulfilled by Messiah Yeshua… the last three feasts remain.] Is it possible that in the first picture where Judah seems to travel ahead of Joseph, that the same is happening today? We’ll explore these and many more questions as we go, but the next step is to grapple with the many names/terms applied by Yahweh through the prophets to the Northern Kingdom. As we understand that ‘Israel’ is not synonymous with ‘Judah’ in much of Scripture, we can begin to wrestle with what Scripture actually says as compared with the traditions of men inherited from both Judaism and Christendom. May the shalom of our Elohim reign in our hearts!! This entry was posted in Deeper Study and tagged Christian error, Ephraim, Jeroboam, Judah, pagan holiday, Samaria, Two House. Bookmark the permalink. Never thought about the division of Leah and Rachel as they enter the land…. Great connection….interesting that Rachel has Laban’s idols… how she hid them… and now they come into the land with the clan…. What is the significance of Laban’s idols in the story? Great piece! Lots to think about. I was familiar with Rachel and the family idols… even laugh at how she hid them, the powerless little unclean suckers… LOL! But, in the context of this conversation, Ephraim is the son of Joseph who is the son of Rachel… Hmmm. 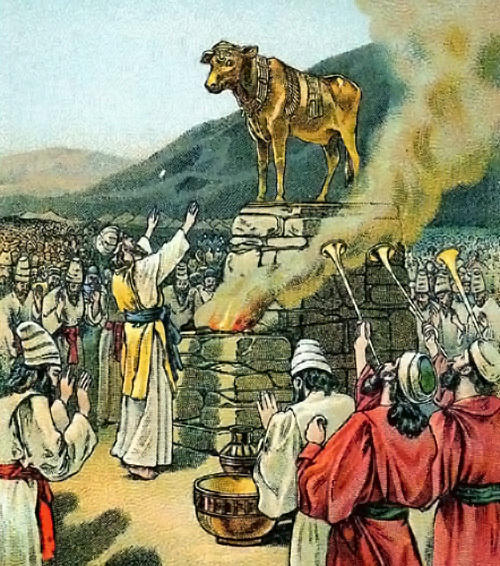 Ephraim’s sin was idolatry and pagan practices that came from the nations…. Very interesting! I had not made that connection!